“The Austin Troubadours is an international group of instrumentalists and singers whose mission is to revive the beauty of musical masterpieces from Medieval and Renaissance Europe.” It is founded in 2008 in Austin, Texas by the award winning lutenist and early music specialist Slobodan Vujisic. 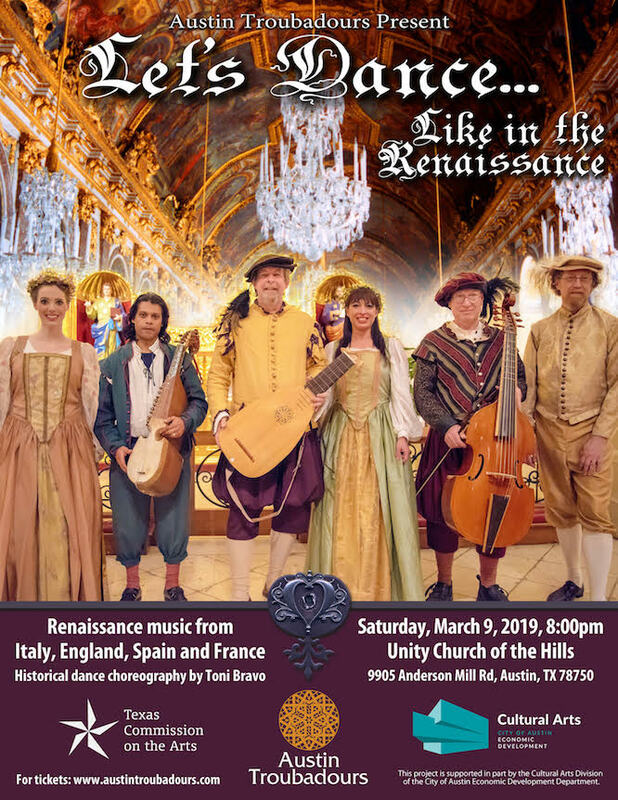 Seven musicians in period costumes with more than 30 authentic period instruments, perform dances and songs of Medieval and Renaissance Europe. A high energy, non-conventional show sets the stage in this historically informed performance. Performers include members of The Austin Symphony and University of Texas Faculty, funded in part by the City of Austin Cultural Commission. Austin Troubadours is pleased to announce that they have been approved for inclusion on the new Texas Commission on the Arts (TCA) Texas Touring Roster. Copyright © 2010-2019 Austin Troubadours. All Rights Reserved. Website produced by eKode.